When I think of classic style the Banana Republic brand always comes to mind. Their styles are always timeless, yet on trend and versatile to wear for work or on the weekend. Last week I received this lace peasant top and these chambray pants from BR's latest spring collection. I have to be honest, I would have never thought to pair these two pieces together, but it was a challenge that I was happy to accept. If you're a long-time follower, then you know I love to take fashion risks, so it was fun to style these two pieces in a way that was most comfortable for me. The top has a boho-chic vibe and the pants are very classic, but the chambray color makes them just as versatile as a pair of denim. 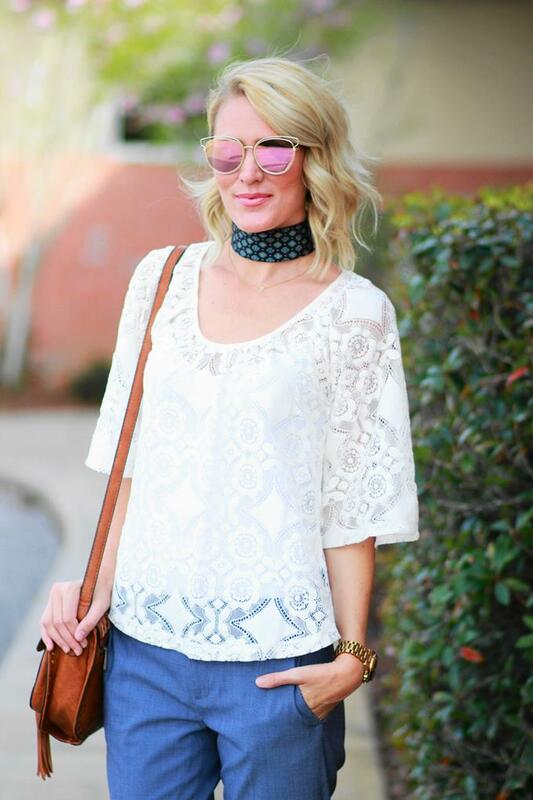 I went back and forth on pairing this top with a statement necklace or a neck scarf, but ultimately the scarf won (but of course) -- I just can't get enough of neck scarves, they're so fun and fresh! I opted for a vintage blue scarf with a pretty print to keep the look cohesive. I went with a boho-chic bag and some fun rose-colored sunnies for some added flare, and finished the look with my fave fringe heels. This look is girly with a slightly laid-back vibe to it, which is just my style. Love how you're always so "playful" with all of your outfits and the way how you style them is so unique! I love the pieces you chose, especially those pumps! I've been really enjoying what banana republic has been doing lately, and I love it even more when it's all 40% off! Such a classic and chic look! Love the scarf detail! 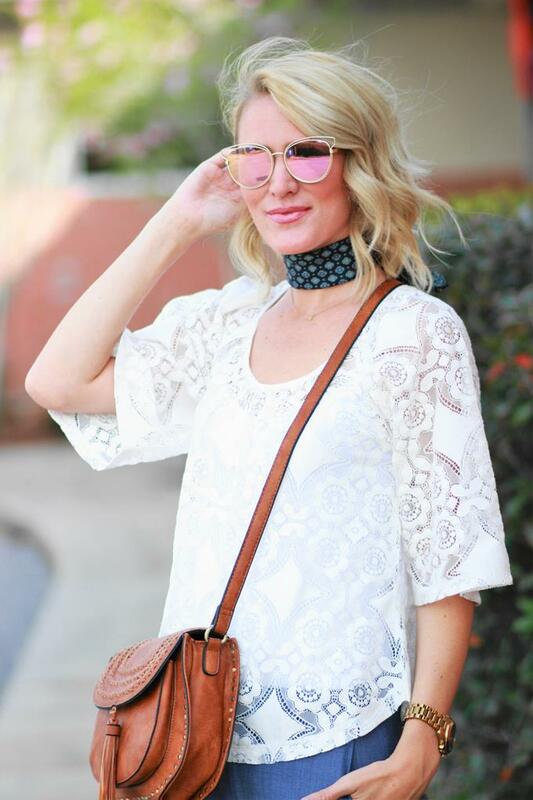 I love this look and the hint of bohemian! The white and the lace and those chambray dress pants come together ever so harmoniously. You look confident and laidback and chic. Love your outfit soo much! Great style dear! Cute sunnies. Hit us up for special pricing on sunglasses. Thanks for sharing and enjoy! Loved this look when I saw it on Insta! Those pants are perfect for spring. You look super casual chic!! I am adoring that top!! Would pair with a lot of outfits for spring and into summer! Great style, girl! You look fab. I have soft spot for lace and those heels are so gorgeous. What a great spring look! Love the lace top. Love this look on you! That top is fab! Such a gorgeous look babe! And that scarf is the perfect accessory. Love the look. What a fun look! Love the casual chic vibes! I love this pairing, Jen! The top is so lovely and looks great paired with the trousers! I'm also swooning over that purse and those sunnies are so pretty! Thanks so much for sharing, girlie, and I hope you're having a great day so far! Such a cute outfit- I love Banana! 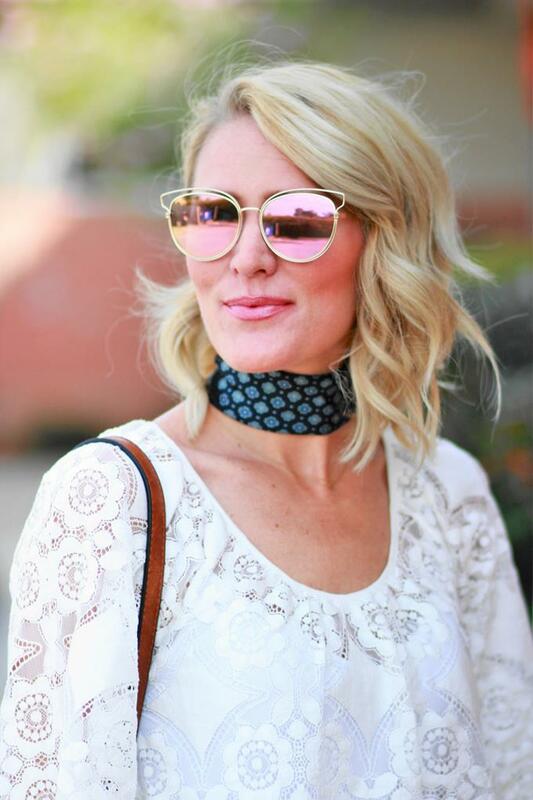 You accessorized this perfectly, too- love those sunnies! perfect outfit!! the addition of the bandana was the perfect touch. Love this look! You really have a fab fashion taste! Love those pants, Jennifer! You look beyond beautiful! You are so stunning, I swear! Beautiful look. Well put together. Beautiful look, well put together. I think the risk paid off well, you look gorgeous in the outfit! I seriously love the top though, the details are so pretty. You look adorable in your lace top! Such a chic, effortless and feminine look all at the same time. I love the versatile pants paired with that delicate top. I adore this pairing, and your shoes are too cute! Loving this look for upcoming spring! Hope you have a wonderful weekend! Totally agree that BR is the epitome of classic chic style, and loving how you styled this look! The top is adorable and the pants are high fashion! Love this look, stunning lace top. Have a wonderful week! I am loving this! Excited to see what Spring looks come out there in the next few weeks!